Week 17 is the most and least important week of the season. 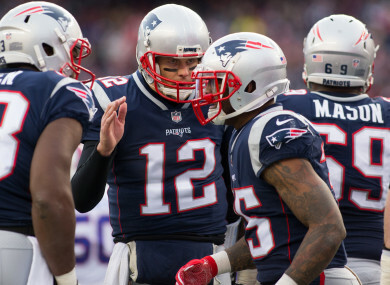 The Patriots will, once again, be the AFC's number one seed after this weekend. IT’S THAT TIME of the year when we all promise to better ourselves going forward only to look back in approximately 365 days time wondering where it all went wrong. Not me mind, I’m definitely going to go to the gym more and drinking less in 2018, just like I said I was going to do in 2017. For the 32 NFL teams, 2018 is at the forefront of their minds even if they won’t be playing football in the first month of the New Year. Some — maybe up to 10 — will be looking for new head coaches, some will be looking for new quarterbacks and franchise players through the draft and some, of course, will be hoping 2018 brings a Vince Lombardi trophy into their trophy room. NFL fans will hope the turning of the year might bring a review of the catch rule which — if the rest of this season is anything to go by — will undoubtedly cause a team’s season to finish prematurely in the playoffs. But before we get to the postseason, we need to wrap up the NFL regular season in a week that contains some of the most — and least — important match-ups of 2017. In 160 pass attempts at home this season, Packers quarterback Brett Hundley has thrown zero touchdowns and seven interceptions. On the road, in 130 attempts, he has eight touchdowns and just three picks. Good thing this game isn’t in Lambeau. The over-under on head coaches losing their job after this AFC South encounter is probably 1.5. And I’d still take the over. Speaking of coaches losing their jobs, the end of the John Fox-era in Chicago will — in keeping with the rest of his tenure — see the Bears suffering a big loss. In the last 1,000 NFL regular season games, just four have featured a point spread of more than 15 points, and Bryce Petty was the starting quarterback for three of them. Matt Moore versus the Pats was the other. The only thing notable about this game is that it’s very likely the last time we see two-time Super Bowl winner Eli Manning in a Giants jersey. Though the Eagles already have the number one seed in the NFC wrapped up, they have not played well since Carson Wentz went down with injury and will need to play themselves into form against a divisional rival. Even in the farthest reaches of Believeland, the most optimistic Browns fan can’t imagine their 0 will go this weekend. All of the important games kick off at 9.25pm on Sunday and this is the most important of them all. The Falcons win and they’re in. For the Panthers, a win would not only go some way towards knocking a divisional rival out of the postseason — if the Seahawks also win — but, coupled with a Saints loss, could give them the NFC South and Wildcard weekend bye. The Ravens need a win to guarantee a place in the postseason while the Bengals left their pride behind weeks ago, even if the Lions gifted them a win last week. The Bills need a win and either the Ravens to lose, or to win and the Chargers and Titans both to lose. Stranger things have happened of course, but there’s a reason Buffalo has failed to reach the postseason this millennium. A win for the Saints will give them a first round bye and, while the Bucs have been competitive in divisional games of late, they should have more than enough in hand in this one, even on the road. Jacksonville is in a weird situation here where a loss would likely give them an easier playoff game — against the same opposition — next week as the Titans have been awful of late. But they also have a chance to stop a divisional rival from reaching the postseason. Catch-22. The Chiefs have found form at the right time but are taking this week to rest their players before Wildcard weekend. Only time will tell if that proves to be a mistake. The Chargers need some favours to make the playoffs but they certainly won’t have to worry about not keeping up their end of the bargain against a hopeless Raiders outfit. Can we just give Jimmy Garoppolo the MVP and the 2019 Super Bowl title right now? Seriously though, he looks the real deal and, against a Rams side resting a whole host of starters, should keep his perfect record as starting quarterback going. The Seahawks need the Falcons to lose and to take care of business at home to Arizona to reach the postseason. I think they’ll do it, but given that Arizona has only lost once in the past four visits to CenturyLink Field, they won’t cover that spread. In the last 1,000 NFL regular season games, just four have featured a point spread of more than 15 points, and Bryce Petty was the starting QB for 3 of them. Email “NFL New Year's resolutions and your Week 17 preview”. Feedback on “NFL New Year's resolutions and your Week 17 preview”.